Senior officials who scrutinise the revenue record of the state keep stumbling upon land scams one after the other. The latest being a scam worth Rs 300 crore in Bisarakh, Jagatpur, Afzalpur and Fatehpur villages of Greater Noida covering 500 bighas of land. As many as 79 waterbodies here have been encroached upon by people with vested interests, like the land mafia and slum dwellers, and 154 are being misused for various purposes, the Delhi Government has informed the High Court. Despite the amazing rise in property prices here over the last couple of years, the basic problems of this industrial hub and the largest city of Haryana remain nearly the same: Lack of adequate civic infrastructure and cleanliness in residential and industrial areas. A job survey conducted by ASSOCHAM reveals that Delhi has emerged as the number one job-creating city in the country, relegating Mumbai to second place. The survey results also showed that the IT and the ITES sectors have maintained their supremacy in terms of generating employment for white-collar graduates and postgraduates passing out from universities and professional colleges. The Prime Minister, Dr Manmohan Singh, presented the Woman Exemplar Award to Ms Raj Rani of Gurgaon, instituted jointly by the Confederation of Indian Industry (CII) and Bharti Enterprises, at the CII annual conference on April 18 at Delhi. The Sarva Karamchari Sangh, Haryana (SKS), the leading government employees’ body in Haryana, has charged the state bureaucracy with creating hurdles in reaching a solution to the demands of the government staff. Not many are aware that since 1982, April 29 is annually observed as World Dance Day and this observance was called for by UNESCO’s International Dance Council or better known internationally as Conseil Internationale de la Dance (CID). The day is observed all over to pay tribute to India which is recognized as the largest arena for dance where, from time immemorial, dance has defined the aspirations, feelings, emotions and even frustrations of the people from every region. 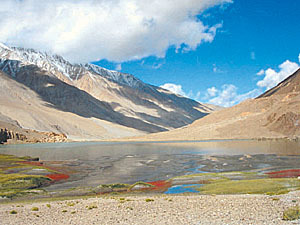 A landscape of Ladhak by Ashok Lavasa. More than two dozen people, including four policemen were injured in a melee in Mutana village of Kakode police station. The injured were admitted to a hospital. PAC has been deployed in the village in view of tension. The police here today arrested two notorious criminals involved in several cases of murder and extortion and claimed to have recovered some weapons and ammunition and over one kilo of charas from them. The Delhi High Court has issued notices to the Centre, UP Government, Noida Chairman and Noida Toll Bridge Ltd on the petition of a defence personnel seeking exemption from paying toll tax at DND flyway while travelling in his private car. The police today claimed to have busted an interstate gang of pickpockets and luggage lifters with the arrest of two people from South West Delhi. A city court has asked a complainant and investigating officer (IO) of a bribery case involving two police constables, to appear before it on May 15. The mercury rose to 38.7 degree Celsius in the Capital today, marking the onset of a hot summer. Ghaziabad, April 23 Ram Naresh Sharma, owner of Kunti Public School in Som Bazar, Khora Colony, was shot dead by three assailants who came knocking at the door of his house. Traders belonging to more than 30 organisations based in West Delhi today sat on day-long hunger strike here against sealing of shops in the residential areas of the national Capital. Ability Unlimited, India’s first professional dance-theatre run by persons with disabilities in collaboration with Frontline Special Schools is going to perform a grand show of “Ramayana on Wheels” on April 30 at Kamani Auditorium. The show will be inaugurated by the chairman of the Indian Council of Cultural Relations (ICCR), Dr Karan Singh. Activists belonging to the All India Youth Federation (AIYF) and All India Students Federation (AISF) will march to the Supreme Court on Monday to protest against sealing of shops, demolitions and dismantling of slums and removal of footpath vendors. Gurgaon, April 23 The city-based Sheetla Hospital and Eye Institute opened a new centre, Sheetla Eye Institute, at DLF City. About 50 persons are reported to have fraudulently got this Gram Samaj land transferred to their names. Mr George Joseph, member of Revenue Board, has ordered the district administration to register cases against the guilty. Two journalists and a woman are also stated to be involved in this fraud. Mr George said 130-bigha land in Bisarakh town was registered as Gram Samaj land as per the old revenue record. A probe revealed that this very land was now registered in the names of 15 persons. The district administration had not issued title of this land to any of these people and their names do not figure in the old revenue record. Now these titles have been cancelled after probe and registration of a case against all of them has been ordered. The accused include Usha, Kalu Ram, Kamlesh, Jagpal, Dharam Veer, Madan Mohan, Radhey Shyam, Indu Goel, Jatinder Pal, Nagnesh Jagpal, Basanti, Manu Chand, Shrikant and Rajender. Mr Joseph said similarly, 14 persons have got 300 bighas of Samaj land in Jaganpur village of Sadar Tehsil transferred to their names. They were not even the natives of this village. In village Atta Fatehpur of Sadar Tehsil also, a 100-bigha land of Gram Samaj was usurped by 20 persons. Mr Joseph said the SDM Sadar has been ordered to institute a case against them, cancel their titles and restore the land to Gram Samaj. Yet another case in which a woman of Anup Shahr in Bulandshahar got 485-acre land marked in her name has also come to light. The situation is so grim that out of 611 waterbodies identified in the Capital, over 190 are beyond the stage of revival, the Government said in an affidavit filed before the Delhi High Court. The High Court has asked the government to furnish within four weeks the list of ‘missing waterbodies’ which were under the control of various government agencies, including the Archaeological Survey of India and Delhi Jal Board. The government furnished the preliminary findings in response to a directive from a Division Bench headed by acting chief justice Vijender Jain on a PIL filed by voluntary organisation, ‘Tapas’. The affidavit, filed by divisional commissioner Narendra Kumar, is only a partial disclosure of disappearance of nearly 100 more such waterbodies in the Capital over the past few decades which is said to be one of the main reasons for the acute water scarcity in Delhi, the PIL alleged. In the petition, the NGO has alleged that hundreds of natural waterbodies like lakes, ponds and reservoirs have been illegally encroached upon by people with vested interests or are under misusue with official patronage. While in 79 of the waterbodies, concrete structures for residential and commerical use have been established, in the case of 151 others, government agencies like DDA and MCD have allegedly converted them into public parks and community halls. As many as 87 waterbodies under the control of DDA have disappeared as these have been encroached upon or allotted for other purposes, the petitioner alleged. Expressing displeasure at the state of waterbodies, the Bench said “there is total disregard towards environment. DDA Vice Chairman will file an affidavit why these waterbodies cannot be revived, what is their status?”. The High Court also directed other government agencies owning waterbodies to file their replies on affidavits within four weeks and posted the matter for further hearing to May 24. Several open spaces here have virtually become a dumping ground for garbage, causing umpteen problems in the process. Sectors 10 and 11, which had been developed by the DLF initially but were later handed over to the Municipal Corporation Faridabad (MCF), are the worst sufferers as far as civic problems go. Though hundreds of encroachments, including illegal buildings and jhuggi clusters, have been removed in the past about two years, there are still about 200 jhuggis in the area. While the civic body does undertake sweeping and cleaning of the roads and open spaces, the residents here were forced to hire private persons to do the job. The open spaces in these sectors have been reduced to a public urinal for the people residing in jhuggis and hutments as not one public toilet is available. Kailash Sharma, a resident of Sector 10 here, claimed the jhuggi clusters in the area had created a lot of problems for the residents. Filth and garbage strewn all around and the resultant foul smell from the open spaces round the clock were quite normal. He said there had been utter confusion over a huge plot of about 12 acres located in the middle of the sector, which he said had been illegally occupied by slum dwellers and was being used as toilet. He said there had been no communication from the administration about the ownership of this huge open space and how and when it would be put to use. He said all kind of rumours were afloat about this area, but the area had neither been notified nor there had been any kind of development. Lamenting that there was hardly any properly developed and maintained park in the sector, he alleged the MCF and the Haryana Urban Development Authority had been treating these sectors in a shabby manner. He added that the open spaces, especially the area meant for parks, had been reduced to garbage spots, thus providing a breeding ground for all kind of diseases. Demanding immediate removal of all kind of encroachments from the area, the residents welfare association has asked for deployment of sweepers and removal of the garbage from here. The authorities concerned had removed several encroachments from the area only after the directions were passed by the high court in response to a PIL filed by a local resident. The Assocham Eco-Pulse study covered the first two months of the year 2006 and found that out of the 6,175 job placements tracked, employers in Delhi advertised for 1,495 vacancies and Mumbai employers for 1,344 placements. The survey showed that due to a boom in the infrastructure development and construction activity, engineering has come a long way up the ladder to occupy the third best position among the employment generating sectors. Out of a total of 6,175 placements across newspaper advertisements in the major newspapers among the major cities, the engineering firms attempted to fill up 1,070 vacancies, 17% of jobs tracked by this study. Three outstanding women in the areas of primary education, health and micro finance, Ms Sangeeta Pardhe of Pune in Maharashtra, Ms Raj Rani of Gurgaon and Ms Vanita Jalinder Pise of Satara in Maharashtra, received the awards. Ms Pardhe provided healthcare to thousand women, girls and infants, while Ms Raj Rani addressed around 1,000 women’s reproductive health issues. Ms Pise made innovative efforts, involving women in the production and sale of paper cups, an income generating project. They received Rs 1 lakh each and a citation from the Prime Minister. Ms Raj Rani, aged 41 years, a resident of Daultabad village, 12 km from Gurgaon city, is formally educated up to seventh standard. She addresses women’s needs in her locality on all reproductive health issues such as the importance of spacing children and safe abortions, the emergency signs of complications during pregnancy, when to approach a doctor during pregnancy, who is a qualified doctor, breast feeding and weaning habits for the newborn, childhood immunisation schedule etc. A simple, homely Raj maintains a stock of contraceptives such as condoms and oral contraceptive pills besides oral iron and calcium tablets that she distributes among eligible couples and pregnant mothers. She maintains a daily diary of her interaction with the villagers, their problems and the counseling she provides to them. She maintains a list of eligible antenatal mothers, newborns and the postnatal mothers for their contraceptive needs and their newborns’ immunisation, motivated and ready to accept services at the health van once a week. She also visits the local Civil Hospital with women who have been motivated by her to undergo permanent sterilisation. Her tact in motivating women to undergo permanent sterilisation is unique, based on each individuals psyche. She was married to Rotash Verma, a class IV employee at Delhi University, at age 16. Her martial life was in no way different from thousands of other married women in conservative Haryanvi families where women are not allowed to step out of the household unescorted. They have four children: two sons and two daughters. Her face reflects her determination and zeal of bettering the lives of both herself and the womenfolk of her village. Her foray into community service began after a brief stint with the District Rural Development Agency (DRDA) where she underwent training for Self Help Group (SHG) formation around six years ago. It has claimed that despite the agreement reached between the employee leaders and the Chief Minister, Mr Bhupinder Singh Hooda, regarding some of the demands on March 9 last, the authorities concerned have failed to issue the necessary orders till today. It has alleged that certain senior officials of the government appear to be bent on damaging the image of the Chief Minister and his government. The spokesperson of the SKS, Mr Subhash Lamba, said here today that a meeting of the senior leaders of the SKS and the Chief Minister had been held at Chandigarh on March 9 and the government had agreed to certain demands, which include reinstatement of the employees by August-end, an additional bonus of Rs 200 to the Safai Karamcharis of each department, removal of anomalies in the pay scales, starting a dialogue on the issue of ‘privatization’ of the ITI’s and giving up the policy of privatization and contractual system of employment in the state. Claiming that the Chief Minister had accepted several demands, but so far no letter has been issued by the heads of the various departments even after the lapse of about 45 days. He said it appeared that the bureaucracy had been ‘misguiding’ the office of the Chief Minister on such issues and alleged that the implementation had been deliberately delayed by the officials concerned. He said the official machinery ought to have issued necessary directions in this connection so that there could have been some progress on the issues. But blaming the bureaucracy, the union has claimed that such functioning would adversely affect the image of the government and the Chief Minister should take a strict action against the officers responsible for the delay in the process. The Sangh has announced to go on agitation from May 4 if there is no response from the government by May 3. 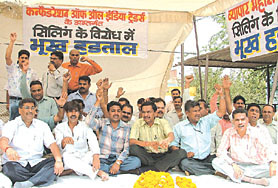 It said the members of the union would sit on hunger strike at all the district headquarters and a demonstration would be held at Chandigarh on May 23 in this regard. This year to celebrate World Dance Day, well-known Bharatnatyam exponent, Geeta Chandran, founder president of the Natya Vriksha, is organising a seminar in collaboration with UNESCO and India International Centre here. A large number of dancers, dance critics and observers are expected to participate in the seminar which will focus on the state of Indian dance today, the changing contours of dance presentation and problems of young dancers. The following day, on April 30, Geeta Chandran is presenting the Arangetram of her disciple Mallika Ayesha Bhargava at the Stein Auditorium, India Habitat Centre here. Mallika, who has only recently appeared for her Class XII Board examinations, has been a student of the Delhi Public School, RK Puram where she was awarded the coveted Blue Blazer for academic excellence for three consecutive years. Mallika has been a disciple of Geeta Chandran for the last 11 years. The Abhyas Trust here presented a unique yoga dance performance at the Stein Auditorium, India Habitat Centre here last week and a presentation of its urban design initiative for the benefit of the select audience. Founded in 2004, the Abhyas Trust is a non-profit organization that concerns itself with the teaching and practice of yoga, Vedic chanting and the study of yoga sutras and creative adaptations of traditional dance forms into contemporary dance theatre with a focus on issues pertaining to urban design. It was precisely for this very reason that the presentation was called “The Power of Seeing” and was inspired by the philosophy of yoga which also suggests a proactive and responsible interaction with society and the environment. See Ladhak without going there! If you really want to get the feel of the beauty of the Ladhak region without actually going there then you might as well spare some time and visit the Art Junction here where Mr Ashok Lavasa is holding an exhibition of his photographs focusing on the natural beauty of the Zanskar region. The exhibition is on till April 30. Mr Lavasa, an Indian Administrative Service officer, is at present posted as the resident commissioner of Haryana Government here. An avid photographer, Mr Lavasa spends most of his spare time in clicking away the nature’s bounty. His photographs have come in for critical acclaim both from professionals and amateurs alike. The Art Gallery at the India International Centre Annexe here is hosting an exhibition of posters that depict and reflect the wide variety of work undertaken by UNESCO on the occasion of its 60th anniversary. The exhibition is on from April 22 to 28. Saba Hasan, a well-known Delhi artist, is holding an exhibition of her recent works entitled, “Letters from Baton Rouge” at the Shridharani Gallery here from April 26 to May 5. Hasan has used the letters written by her mother from Baton Rouge, the United States of America in 2003 in Urdu which has now evolved beyond the traditional Bismillah category and become a cultural symbol. The Hungarian Information and Cultural Centre here is holding an exhibition “Light Breaking Through” comprising painting and sketches as a tribute to the artist, Elizabeth Brunner. The exhibition which was inaugurated on April 19 is on till May 19. The noted Hungarian painter passed away on May 2, 2001 in India. Elizabeth Brunner had come to be known as an eminent portrait painter of the national movement in India. 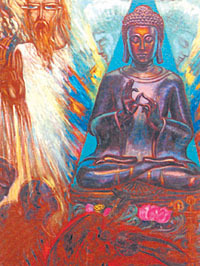 After her mother’s death, who was also an artist of note and who incidentally was also known as Elizabeth Sass Brunner, she held several exhibitions the most famous of them being the one during the Budha Jayanti celebrations in 1956. The exhibition was later also held in Sri Lanka and Thailand. She was conferred Padma Shree in 1985. It all started when the police rained lathis on villagers as the latter opposed the construction of a wall by the side of a village pond in Mutana village under Kakode police station, Javer, on Saturday. The police were reportedly constructing the wall near a pond at the behest of the ruling party activists. Angered by the lathi-charge, the women and men resorted to stone-pelting. The police then opened fire and dragged people out of their houses. According to eyewitnesses, the SO Kakode police station Sangram Singh had suddenly descended on the village on Saturday with his force and started the construction of a wall near the pond. When villagers opposed it, the cops started beating the villagers, some of whom were chased and dragged out from their houses. When village women came to the rescue of their menfolk, police did not spare them either and rained lathis on the women, many of them were bleeding profusely. SO and three other cops were injured in stone-pelting. Soon help from neighbouring police stations reached and the policemen fired many rounds. The cops reportedly misbehaved with women after barging into the farmers’ houses. Many pregnant women were also beaten up, people said. When the matter was reported to the District Magistrate, he ordered the stoppage of construction. Meanwhile, wives of half a dozen farmers are recovering in the local hospital. Acting on a tip-off, a police team kept vigil on Khirva road and at noon two noted criminals — Vinod Gandhi and Vishwas — riding a motorcycle, fired upon the police party, the local SSP claimed. The police team, however, succeeded in overpowering and arresting the duo, he said. The team recovered one 9 mm pistol, a live cartridge and one empty cartridge from Vinod Gandhi and one country-made pistol .315 bore with one cartridge and one empty country-made pistol from Vishwas. Over one kilo charas was also recovered from each, he said. Both the men are habitual criminals and used to commit murders on contract and cases of firing and threatening for recovering ransom have been registered against them, he said. The SSP said the two criminals had novel way of recovering ransom from traders. They first used to fire on the targetted shops and other business establishments to terrify the traders and then extract money after calling on phone, he said. During interrogation, the duo are said to have confessed to their involvement in cases of murders and extortions. Justice Vikramjit Sen asked the respondents to file their replies to the petition by November 4, the next date of hearing. Counsel Rekha Palli appearing for petitioner Colonel T Prasad submitted that the levying of toll tax on armed forces personnel was illegal and was in violation of the provisions of the Indian Tolls (Army and Air Force) Act of 1901. Ms Palli argued that the DND Flyway was constructed and operated by Noida Toll Bridge Ltd on public land. The DND Flyway was constructed over the Yamuna river connecting Delhi with Noida in Uttar Pradesh on build-operate-lease-transfer (BOLT) basis with a private company. Defence personnel were entitled to cross over the bridge from Delhi to Noida and vice versa without paying the toll tax, said the petition. The applicants had submitted a representation to the joint secretary of Ministry of Defence in this regard on June 2, 2004, but no action was taken, said the petition. Dharam Pal Sansi (36) and Vinod Sansi (30) were arrested yesterday from Dhaula Kuan bus stand when they were trying to board a Jaipur-bound bus. The gang operated in Delhi and Haryana, police said. The police recovered two .315 bore country-made-pistol with four live cartridges from them. During interrogation, they revealed that two more people were part of the gang and that they used to target passengers on busy bus stands like Dhaula Kuan and Peera Garhi. In another case, the police on Saturday arrested a person for allegedly manufacturing Glucon-D, which is a product of Heinz India Pvt. Ltd. The accused has been identified as Sandeep Khullar, a resident of Kirti Nagar. The police also claimed to have seized machines, semi-furnished and furnished material from the premises at Mayapuri Industrial Area-I. The police said that the accused was manufacturing Glucon-D illegally. During investigations, it was revealed that the accused was earlier a bank employee, but for the last 10 years, he had been into this business in the grab of a cutlery business. A case has been registered at Mayapuri police station. A special CBI judge asked complainant Ashok Kumar and the IO in the bribery case against constables Ishwar Singh and Bhawar Lal to be present in the court. Kumar had filed a complaint in the court of the chief metropolitan magistrate on May 4, 2005 that the two constables were demanding bribe from him. According to the complaint, the two constables, posted in Dev Nagar, had demanded the bribe to let him run a tractor-trolley used in his construction business. It said the constables had received Rs 18,000 from him in nine months. However, during a court hearing on June 21, 2005, Kumar retracted from his statement and urged the magistrate to allow him to withdraw the case, who declined to do so. The minimum temperature also soared to 22 degree Celsius. The Meteorological Department said the rise in mercury since the past three days was indicative of a further rise in temperature in the coming days, which would eventually lead to a return to scorching weather conditions. The rising trend in mercury, coming after eleven days of relatively cool weather which saw the temperatures plummet to a low of 32 degrees Celsius earlier this week, is due to dissipation of the upper air cyclonic movement. The upper air cyclonic storm, originating from Rajasthan, had moved away from the Capital since Friday, setting off a series of dry winds over Delhi. The weather office has predicted a partly overcast sky and squalls in some parts of the Capital. The weather office said the minimum temperature on Tuesday could touch a high of 23 degree Celsius on April 26. Ram Naresh Sharma, owner of Kunti Public School in Som Bazar, Khora Colony, was shot dead by three assailants who came knocking at the door of his house. As Sharma opened the door, one man shot at him. 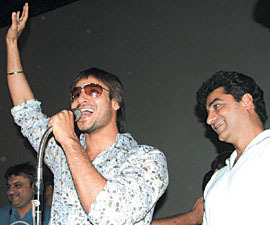 Ram Naresh Sharma, according to sources, was shot dead because of a disputed plot of land. Hearing the sound of gunfire, Sharma’s family members rushed out. Seeing his father in a pool of blood, Amarnath and others were stunned. The victim was immediately rushed to a nearby hospital where doctors declared him brought dead. Amarnath told the police that his father Ram Naresh Sharma had a dispute since 2000 with Sardar Hardev, Rajbir Gujjar and Rohtas. The traders also launched a citywide ‘signature campaign’ from Rajouri Garden to garner support for their demand of promulgation of an ordinance or introduction of a Bill to regularise all commercial establishments. Trade organisations from several parts of Delhi will obtain signatures of traders and citizens till May 8 which, alongwith a memorandum, will be submitted to President A P J Abdul Kalam on May 9. A delegation of traders is scheduled to meet Union Minister of State for Urban Development Ajay Maken tomorrow and submit a memorandum. The traders will also sit on a hunger strike tomorrow at MCD headquarters as part of their relay hunger strike which will continue till May 27. According to the director and choreographer of this show, Guruji Syed Sallahudin Pasha, the show will be performed with the cast of about 50 mentally and physically challenged children groomed by their organisation. In a press release issued here on Sunday, AIYF secretary, Mahesh Rathi said that bulldozing houses, sealing shops and dismantling slums without any effective alternative is a violation of fundamental and human rights of citizens. He said that activists of AIYF and AISF will assemble at Mandi House at 1 pm before proceeding to the Supreme Court to submit a memorandum to the Chief Justice of India. The city-based Sheetla Hospital and Eye Institute opened a new centre, Sheetla Eye Institute, at DLF City.